I haven’t been to the cabin lately, so I thought I would fill in with another design I’ve been working on. 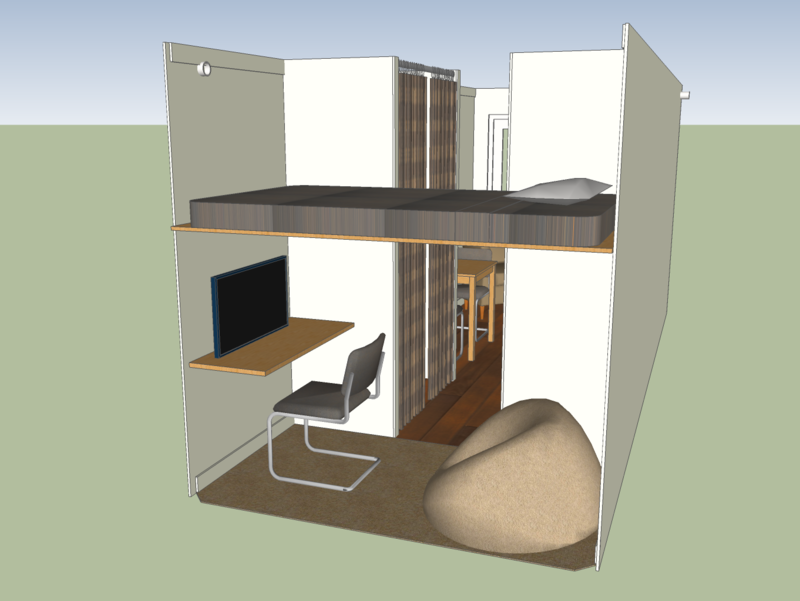 I wanted to try and design a comfortable cabin, for just one or two people, in a single 20′ shipping container. Let me be upfront here, a lot of inspiration for this was taken from the Tumbleweed Tiny House Company, except this one is much more secure. Like the Tumbleweed houses, this would be the perfect candidate to build at home in your spare time and have delivered to a remote location when you’re done. This design would be extremely easy to build compared to what I’m doing now. The foundation could be as simple as a couple of railroad ties or some concrete blocks. A roof would be optional, and only necessary if you needed the shade. No welding, no cutting, no structural reinforcement, and no sealing of gaps between containers. The entire cabin could even be transported and delivered on a flatbed trailer pulled by a pickup. A necessity with this design, in my mind at least, would be a sliding glass or french door. While I’m not a fan of sliding glass doors, they are probably the only way to get enough natural light into the container without having to cut out the walls for additional windows. A bunch of portholes would add more light and still be secure, but that would quickly get expensive. There are other issues with a 20′ container cabin though, and they all revolve around size. There’s just not enough space to have everything, or enough of what, you want. This design does have most everything my current cabin has, just smaller. The one thing that’s barely present though is the living room – it’s been reduced to a single comfy chair. The hardest thing to fit in a cabin of this size was a wood stove. While it would be easier, and cheaper, to just use a vented propane heater of some sort, a cabin without a wood stove seems incomplete to me. Fortunately there are some tiny wood stoves manufactured by Navigator Stove Works that fit very well in small spaces. Their Sardine stove would be the perfect size and heating capacity for a cabin of this size. The only drawback to the Sardine is price – about $1,090 excluding the specialized stove pipe and fittings. If you really wanted a propane heater, Dickinson Marine has a couple of tiny propane heaters for the marine market, although they aren’t much cheaper than the Sardine. The “bedroom” is a bit of a compromise in this design. I couldn’t quite fit a queen sized bed in there without affecting everything else. A 48″ wide “3/4” bed was the best that I could do, but another bed could be permanently or temporarily placed below it if you don’t like sleeping really close to someone. The primary bed is lofted as much as possible, and would provide for a variety of other uses underneath. One possibility would be a convertible office/home theater room. A computer monitor/TV could be mounted to the wall above a desk that folds down for watching TV. A large bean bag chair for two on the other side would be very comfortable for watching movies or just relaxing. Depending on what is done with the back bedroom, a high cube container with an extra 1′ of headroom would be helpful – if you could find one. This entry was posted in Design on May 24, 2011 by Steve. In my experience, hinged patio doors are far superior to sliders. The drawback for a small cabin is the need to leave space for the door(s) to swing. Using one fixed glazed panel with a single swinging door would work well. The problem with hinged patio doors, as you pointed out, is that they need to open in and will take up valuable space. The other issue is how to incorporate insect screen which is a necessity for the mosquitoes here – sliders work better in this regard. I would still do the slider for this one even though I don’t like them. I thought about this some more after sending you the above comment. There’s no reason that the door can’t swing out especially since you have the container’s doors as an additional layer of security and weather protection. Doors in commercial buildings swing out. As to the screen, you may find this rolling screen useful. Most hinged patio doors are out swing. at least they are here. Being a contractor for alot of years, my house personally has all outswing doors . the reason being it is alot harder for would-be thieves and such to kick in an outswing door. It is not going to stop someone who really wants in but they do have to put a greater effort to do so. It’s not just the unseasonably cold weather here, but also what seems to be a never ending rain. This is the worst spring that I can remember. I do plan to go up this weekend with my kitchen cabinets and some other furniture from Ikea, but I still have to get the drywall finished first – I REALLY hate mudding drywall. While you are at Ikea, check out the handsome, space-saving “Norbo” wall-mounted drop-leaf table. In a pinch it can seat two, and makes a good desk top for paying bills etc. It is solid wood and comes in birch or antique pine finish. To bad i live so far away, (NH). Can’t believe the quote you got for mudding and taping, I could have done a 20×24 probably around $450.00. your cabin looks great can’t wait to build my own. 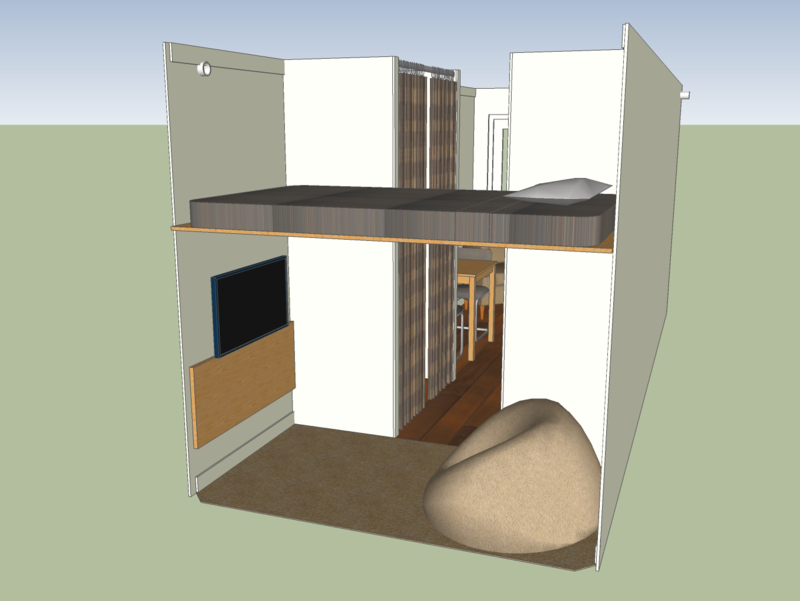 Having lived in Japan where space is premium, and all spaces multifunction, I love studying the tiny house plans. This is a cabin for occassional use, and if you could acquire real Japanese futon that fold for storage in that country, I think you could save some of the overhead space in the “bedroom”…they could stack on the wall across from the TV for a “sofa”, and you could hinge a fold down shelf for laying an extra out when you are dealing with the extra person. Don’t have a tape measure handy, or I’d give you dimensions, as i am sleeping on futons we brought back…another advantage is that on a sunny day you can hang your bedding out to catch fresh air and sanitizing qualities. One question I have is why benched sofas are not in more use–storage beneath–and with a hinged back rest support that could be folded up and away reveal a twin width (or futon) bed area, with pillows & extra bedding tucked behind. Tables, too, could be hinged to fold away, and dining chairs could do the same–somewhere in DWELL magazine I know I’ve seen them used like decorative elements with utility! Maybe you could do the same with a bike. In your plan there is an piece of furniture I was unclear of it’s purpose near the door across from the easy chair. I am assuming it is a table/bench with storage. One other thing that might work for storage is to do a book shelf about a foot below ceiling level around the living space. Planning such details as you have has got to be a labor of love–thanks for sharing. I have actually found some of those futons for sale in the US, but the prices are very high. For my real cabin that I’m building, I’m going to use an Ikea BEDDINGE sofabed in the living room. It has some storage underneath, mainly for bedding, and converts to a queen sized bed. That piece of furniture near the door is a bench for removing and storing shoes. Something I found to be a necessity up there is a “mudroom” where you can take off and store wet/dirty clothes and shoes. Traipsing through the woods, especially in winter, can be a messy proposition. Too many small cabins fail to plan for this reality. Google SketchUp is what I have used for all of my designs, and the best thing about it is that it’s free. It’s complicated enough that I don’t think I can teach you how to use it, but there are a lot of resources on the net that can. If I was going to design a 40′ version of this cabin, I would only do it if I could find a double door container. A double door container has a set of doors on each end of the container. Without this, you would have to cut holes in the walls for windows to have enough natural light. That would negate the security benefits of a shipping container to the point that you might as well go with traditional construction. If I was using a 40′ container, I would probably just stretch everything that I already have in the design to make it more livable. For example, the “living room” would have a sleeper sofa with a flat screen TV on the wall across from it. The bedroom would have a traditional queen sized bed on the floor, and would be at the far end with another set of glass doors and a deck. One thing that would have to be changed would be the heating system. It would be extremely difficult to get a single wood stove to heat a 40′ container evenly. For myself, if I was a young single college student again, the 20′ tiny container cabin would work just fine. Two items might solve your problems in a long container adaptation: They now make sun-tube skylights for flat roofs which you could use spaced regularly or irregularly through the roof to admit light without needing a double-door container; these are insulated so that you don’t get too much heat in summer. Second, get a little heat- powered “eco-fan” placed atop your wood stove. Here’s a site on how to choose the right one for your needs: http://www.alternative-heating.com/wood-stove-fan.html . These were designed for long canal boats in the UK, and they equalize the warm air by pushing it down a long narrow space; though a little expensive, you will use less wood to heat the space. I’m not sure if you’ve seen a container roof up close, but they are corrugated for strength and not flat. If you have a link to one that would work with a corrugated roof, I would definitely like to see it. My experience with the Ecofan so far has been mixed. They do work, though not very well. I plan on building a ceiling mounted fan above the wood stove using a 12VDC computer fan for more circulation this winter. I will do some comparisons at that time and report back. If those are for just a single student I would say they are great. I lived in some real dumps in college and would have loved something like that. Not quite cabin material, although I do like the inset deck off the bedroom. Maybe turn it into a screened in porch for those of us who live in mosquito infested areas. Great site and extremely informative! I’ve been living for weeks at a time in a 20′ container on my acreage in Southern AZ with no problems. Mine has steel doors at both ends, framed out with sliding patio doors from Pella so I can regulate airflow by opening and closing the doors. And the views from both ends are fantastic. A foldout sofa makes a good bed, with enough room underneath for storage. The bathroom is an outhouse and outdoor shower, but hey, that’s country living! Some questions though: what kind of tools did you use to cut the hole in the roof for the woodstove chimney on your larger design? How about through the side for this smaller design? Have you had any problems with water seepage from exposed portions of the floor into the interior when it rains hard? I definitely get that when the rain comes down sideways, though closing the metal doors on the side of the approaching storm solves that problem. Once again, great site, and great research! I’d love to see your floor plan for your dual door container cabin. Send me an email through the contact page so we can correspond directly. For the chimney I was able to us my Bosch jigsaw with a metal blade. It took a while, but it did make a nice clean cut – I wouldn’t want to remove a wall with one though. For a single container with no additional roof, exiting a wood stove out the side is the best option in my opinion. I wouldn’t want to compromise a perfectly good container roof with a hole for a chimney. I’m not sure where you are getting seepage, but I just don’t think it’s possible with my current design. My exterior walls extend past the wood floor and end where the steel floor slopes downward – you can see this in my “Exterior Walls” post. I have aluminum flashing that extends out from under the tar paper and is heavily caulked underneath. My roof overhang is also three feet over the openings which almost completely eliminates any rain from getting to the walls. Do you have any idea what your cost per square foot is? What is your budget and how are you doing sticking to it? I’m not sure if you’re asking about my real container cabin or the tiny one I am theorizing about in this post. 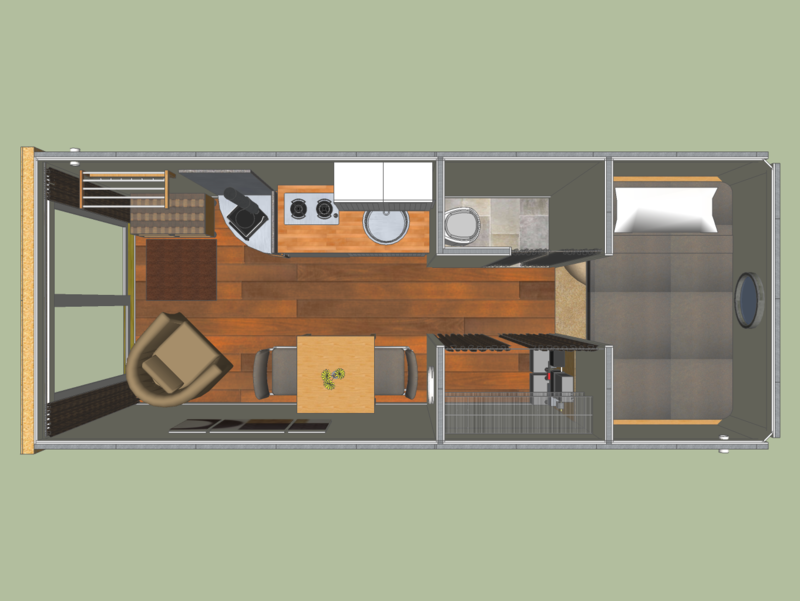 My real cabin will be about $75/sq ft, complete with furnishings, when it’s done. If you take the furnishings out, but still keep the kitchen, it works out to about $70/sq ft. In regards to my budget, I spent a lot of time planning for this and the costs are fairly close to what I expected. 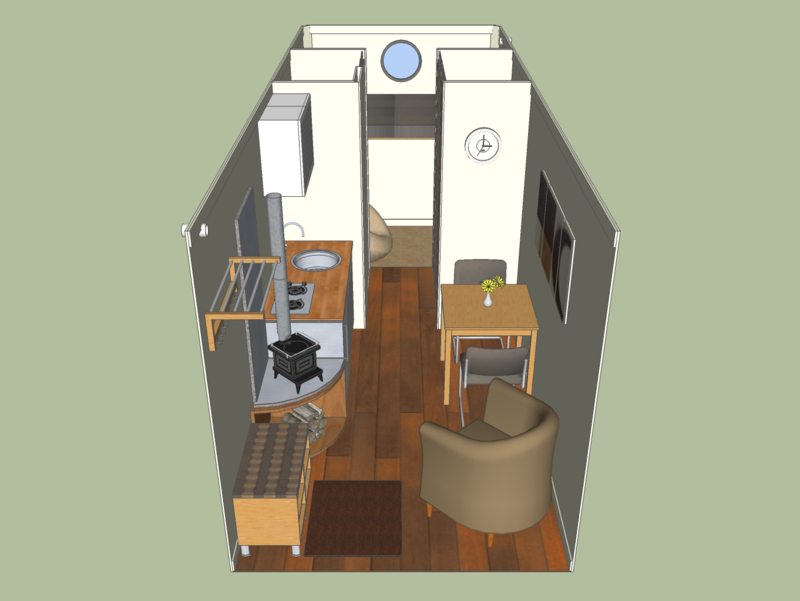 I’ve started to work on a cost for the tiny container cabin in this post, and my initial estimate is about $7,000 with a kitchen but no furnishings. This estimate is based on a new shipping container, so it could easily drop 1.5-2K with a used container. The cost per square foot would range from $35-$50 per square foot. 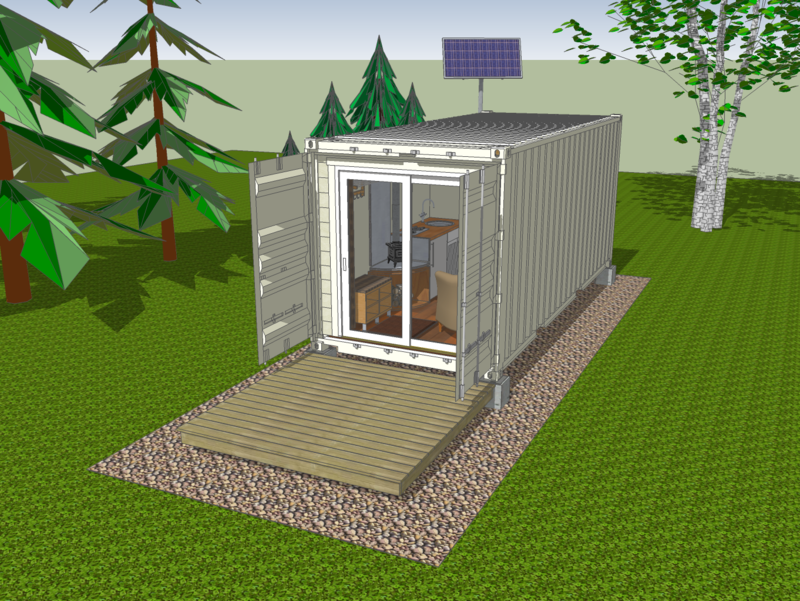 Costs for a container cabin really drop when you’re only using a single container as there’s no welding, cutting, foundation, or roof. Love what you are doing and especially the fact that you are sharing your labor of love with all ot those who see the real value in what you are doing. This is my first comment on your progress on the “3 containers into 1 project” as I have just been lurking and watching since late last summer or early fall and have enjoyed your website and it’s information tremendously. 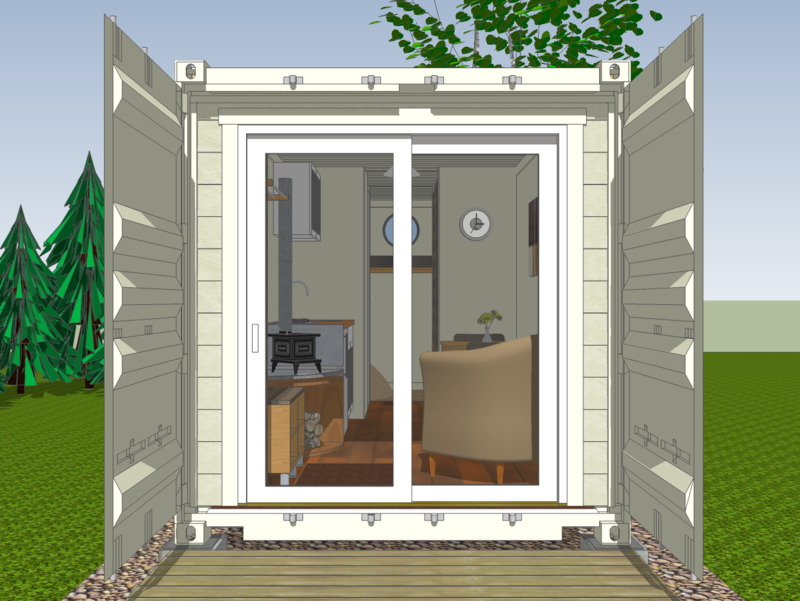 I really like the idea of the single 20′ container cabin too. I’m completely enjoying your journey and renderings of these container cabins. On this small one the one thing that may be missing or if this was already mentioned, is a second door. If a fire broke out from the wood stove or kitchen area how would someone get out? I assume through the bedroom window. Perhaps a door off the back bedroom would be good. Maybe it could lead out to a back deck. Keep up the great work! You are correct in that a second door would be nice to have. There are dual door containers that would allow access from both ends, but those are harder to find. This is actually a common problem with many tiny houses, such as the Tumbleweed, as most of them only have a single door. They do have windows in the loft, but they are usually pretty small and would be hard to get out of. I have wanted to do this very thing once we bought a 40′ container that serves as a tack and feed room at the farm. I want to convert a 20′ into a small cabin I can drop in the woods on our property. Would be nice to have a get away that is critter proof as well as thief resistant. Thanks for spurring up my desires again, may become my winter project. Outswing patio doors are norm here in South Fl. They can be easily screened with a retractable screen such as a Phantom TM screen. The overall design is fine, but you can make better use of the space by eliminating the bedroom and incorporating a daybed in a captains bed style.